A racist incident on a Kulula flight has affirmed Julius Malema’s claims as truth that the wite South Africans are racists. The EFF leader, Julius Malema caused huge controversy with his comments at a rally accusing Indian and coloured people of being racist. “The majority of Indians are racists – they see themselves better than most of us. Even coloureds see themselves [as] better than blacks,” Malema said while speaking to a crowd of supporters at a rally held on Youth Day in the North West city of Klerksdorp. Some feel Malema’s assertion that most Indian people are racist and that many coloured people are too, itself constitutes racism. However, some of Malema’s supporters have taken to social media to voice their support for his statements, which they consider to be true. 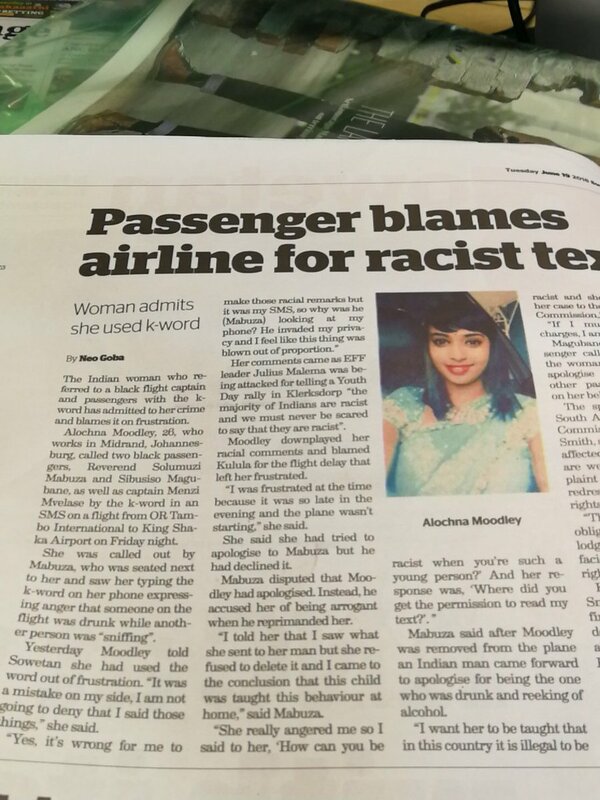 An incident on a Kulula flight last Friday involving a 26-year-old South African Indian woman named Alochna Moodley has been considered by some on Twitter as vindication of Malema’s controversial comments. Moodley was spotted by Reverend Solumuzi Mabuza, who was seated next to her, typing the ‘k-word’ in a text message. Mabuza, who saw her use the racial slur while expressing anger that someone on the flight was drunk while another person was “sniffing” then alerted the flight attendant, who removed Moodley from the flight before takeoff. Moodley has since blamed Kulula’s delays for her “frustration” and admitted to the comment. “It was a mistake on my side, I am not going to deny that I said those things,” she said. While many condemned Malema’s remarks, an article in The Daily Vox by a South African Indian woman, Aaisha Dadi Patel, argued that Malema “might have a point” about racism towards black people within the Indian community. In the article, Patel argued there was indeed an issue with the way some Indian South Africans treated black people, and that Malema’s comments had “paved the way for Indian people to confront some uncomfortable truths”. Recently, EFF chief whip Floyd Shivambu was the subject of controversy regarding the EFF’s views on Indian South Africans after he questioned the presence of Treasury deputy director-general Ismail Momoniat’s presence in finance committee meetings and accused him of undermining “African” officials at Treasury. The response of EFF supporters on social media shows that, regardless of the controversy Malema and Shivambu’s comments have caused, their views about Indian and coloured South Africans are not without support.